​Sidney Charles Mills was born in Frampton on 29 September 1897 to Mark Mills, a bricklayer, and Flora Ellen née Aldridge. By 1911 the family's home was at present-day Ferndale, The Street, next to the New Inn. Sidney was the second youngest of seven children, three years older than his brother, Walter Harold. In May 1906 the school logbook records him being one of only three children to attend every session the preceding year. 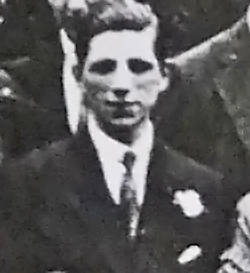 It is not certain what Sidney did immediately after leaving school, but the opening of Cadbury's factory in the spring of 1916 brought him employment, for when he enlisted in the late summer, he gave his occupation as a chocolate worker. On 15 September 1916 he joined the Royal Navy at Devonport as an ordinary seaman and was appointed to its training school, HMS Vivid. After two months he was posted to the battleship HMS Centurion, in which he was a shipmate of Herbert Charles Drayton, until 9 August 1917. Sidney then underwent a further three months of training which resulted in promotion to able seaman, before serving in HMS Devonshire, a cruiser escorting Atlantic convoys, until July 1918. He was then posted back to Devonport until his demobilisation on 14 April 1919 after which he was awarded the British War Medal and Victory Medal and paid a War Gratuity. Sidney returned to Frampton, probably to his parents' address, until at least the mid-1920s, and his war service is commemorated on the plaque in the village hall.